Only about an hour after Matt Jones reported that UK defensive coordinator Matt House will leave for Kansas City, the KSR crew is at the UK football facility for a photoshoot with Mark Stoops and Kenny Walker. 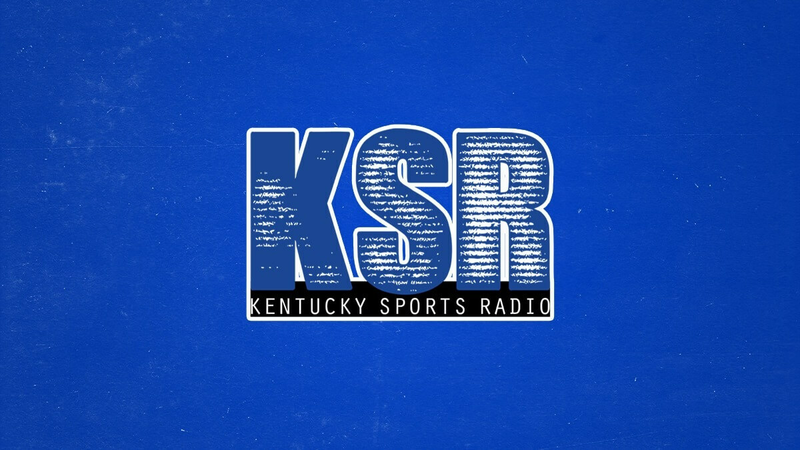 Find out why it’s going down and prepare for the Kentucky-LSU game by listening to this morning’s edition of Kentucky Sports Radio. KC probably called up Kroger to see they could give him a coupon for House. Cheapskates. Wonder how many Kroger fuel points KC got for paying that $150k? lol better hurry, they expire at the end of next month! I’m a little bummed that we are losing him. But not as bummed as I was yesterday after hearing that we lost a top 5 recruit to Dwight Schrute. Still can’t believe that crap – the Wiseman/Hardaway connection was somewhat understandable – this one just baffles me. Hate to see him go but don’t blame him. I’d be insulted if I were him after they had to spend days deciding whether or not he was worth $150,000 buyout with all the money they have in KC. But that’s no reason to pass on a great opportunity. I am pissed that KC didn’t want to pay House’s buyout, then went on a smear campaign against UK saying we wouldn’t release him to try to pressure us and make us look bad. Then finally decided to just pay the buyout, because I’m pretty sure that’s what happened. Eff Kansas City. Agree, J-Dub. Sounds like they wanted to bully Mitch and Mitch wasn’t having it! No backing down. Losing House was bound to happen eventually, and that kid was never ours anyway. I’m more anxious about how the football staff fills out after White presumably steps up to DC. Weird spin to now act like House would have been the “unhappy person on the boat” if he’d stayed. UK couldn’t force him to stay here, they could just enforce the buyout which was a reasonable position, not stopping him from leaving. He was more likely torn between staying and going and the Chiefs deciding to pay was the tipping point. Watched Kansa$$ vs TCU last night; never saw TCU’s home court before…thought I was going blind. Never saw a white basketball court before. Yeah, I hadn’t seen it before either. It was awesome, wish more teams would use custom courts like that. RCF we would do checkerboard before all blue 🙂 fans would lose their minds! That court makes my eyes hurt to watch it on TV. Kind of like the contrast is turned way up on one of those old tube TV’s. I thought Kansas was going to choke and lose, but they pulled the win out. UNC went down to Virginia. Speaking of Kansa$$, on the Wiki “Winningest College Basketball Programs” it looks like the Jaybirds entire basketball history has been, umm…vacated. Who would do such a dastardly deed? I still find myself more annoyed with KSR and the other media when a back and forth like this happens than I do the individual waffling. They could report possibilities without acting like they’re a huge done deal. You know how we would have known for sure that he was staying or leaving? When the University officially announces it. Agree. Being first to throw something out there is not the same thing as good journalism. Not that I expect a blog to meet that standard, but still. So do we wish for a giant sinkhole to swallow Yum tonight, or do we hope Duke loses? If they lose,they’ll just go from 2 to 3 lol But I don’t think they’re gonna lose. Lose lose. I guess I’ll just pretend it’s not happening. I doubt I stay up for that one. Y’all know I’m not a “late” night person on weekdays! I would have to laugh if UL were to beat Dook…ESPN would implode. So if we beat Louisville, and they beat Duke, does that cancel out when Duke beat us? Saw Dook had another “hit everything they threw up there” game against Virginia…can’t be beaten when they do that. Most people probably don’t realize that there is a ginormous tunnel under the riverfront in Louisville to filter the river water. So the sinkhole thing might not be out of the realm of possibillity. But I will definitely be pulling for Duke to lose. Notice how I worded that. ;). And my innocuous comments get moderated again. I really just want to know what the modbot algorithm is. I wonder if the trolls ever get moderated? LOL, they WERE whispering…thought I was going deaf, too. Oh GET OVER YOURSELF, Matt. You’ve done way worse to him. Can dish it out…can’t take it. Ha ha. I just texted him that he should have proposed this weekend anyways. Matt did do a Rumor that Drew got engaged. And he’s ruined Amanda’s day several times. Matt does encourage Ryan to get into shenanigans. I’ve never met him, but I know I would hate being friends with Matt. I can’t see myself ever being able to call Matt a friend if we met. Makes my skin crawl just thinking about it. I’m gonna have to shower now ha ha ha. No way anyone with any common sense would hear that yesterday and think Matt was honestly married. You could tell by the tone, response, everything. Matt can’t take it. Can’t be made fun of or joked on. Has to have upper hand at all times. Maybe it’s an only child thing. He never had siblings to get the best of him growing up. Realme, what Matt needs is a good old fashioned Dutch Rub, and maybe a wedgie to top it off. RCF, and top it off with the “dope slap” to the back of the head. I had to have the nasal scope like Shannon had one time, and it was one of the most uncomfortable things I ever had to tolerate. Not fun. I found the terror before it happened to be worse than the actual thing, lol. Try going to the gynecologist. Lol! One good thing about not being a female. Yeah, living with three females I have learned never to whine about physical afflictions or procedures in their presence. I had to have that awful nose scope last year. The creepy doctor tried to force me to watch the screen when I said I wasn’t interested. At least the LSU guy doesn’t gather his shorts in a way that makes him look like he’s wearing a diaper, the way Brad did. I still say he should just have his shorts hemmed properly. “We wear short shorts” was written by Bob Gaudio of the Four Seasons when he was 15 years old. They look dumb on male basketball players, though. OK for the girls’ teams…my opinion. I hope we’re not trending toward another short shorts era in basketball uniforms. That would lead to a lot of loose balls on the court. Reid Travis gets all of the rebounds.